If you’re looking for a satisfying lunch that's not loaded down with carbs, you could try one of the fantastic range of fresh salads from Marks & Spencer's Count on Us… range. If you ever thought salads were boring, you may change your mind when you see the imaginative selection of ready to eat salad bowls in M&S. 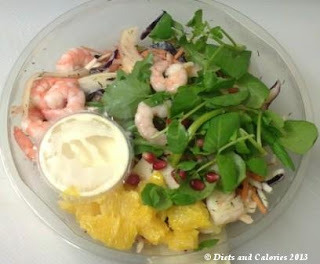 This bowl, called ‘King Prawns & Crunchy Citrus salad’ is low in fat and has only 135 calories per pack. 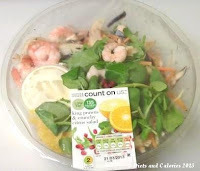 This 300g salad bowl is described as ‘crunchy vegetables with king prawns, oranges & a citrus mayonnaise dressing’ and it contains 65% less fat than Marks & Spencer's Prawn layered salad. Ingredients include cabbage, cooked king prawns (16%), oranges, citrus mayonnaise dressing, fennel, carrots, celery, pomegranate kernels, rocket, watercress and dill. This is a lovely, refreshing salad which is surprisingly filling. It's also good to know that each salad bowl contains 2 of your 5 a day. It’s perfect as a light lunch on its own, especially if you’re following a low calorie diet. It would also work well as a starter course before a main meal. The crunchy pomegranate seeds provide colour and contrast as do the orange segments. The combinations work amazingly well together with the mayonnaise providing a luxurious finish. You can find this and many other salads in the chiller cabinets of M&S food stores. Nutrition Information per 300g pack: 135 calories, 3 ProPoints, 12.6g protein, 9.6g carbohydrate, 6.0g sugars, 3.6g fat, 1.2g saturates, 4.8g fibre, 1.20g salt. Weight Watchers ProPoints calculated by Marks & Spencer for informational purposes only.